August 31, 2017 What if I get two PPS security questions wrong? By default, all accounts are set to the GMB Security question. This is a setting in your Preferences, see screenshot below. ABOVE: How to change the security method. (1) and (2) be on your Preferences page (3) Select the Pay per Scene tab (4) Set an option. More info. GMB Security question, answered two questions wrong in a row? But if you get two of these security questions in a row incorrect, the system locks your account from adding more credit. The system assumes – to be safe – that it’s not really you trying to add credit (perhaps some has guessed your password, and is trying to bill your card for their own desires?). We need you to re-verify who you are, by re-entering your credit card details on the secure site GMBill.com, our billing company. ABOVE: The alert shown when two security questions have been answered incorrectly. You need to do this even though your credit card is likely not expired or otherwise faulty – it’s just to prove who you are, and re-set the blocking on the PPS credit topup. We apologise for the frustration, but we’re working hard to keep your personal information secure. 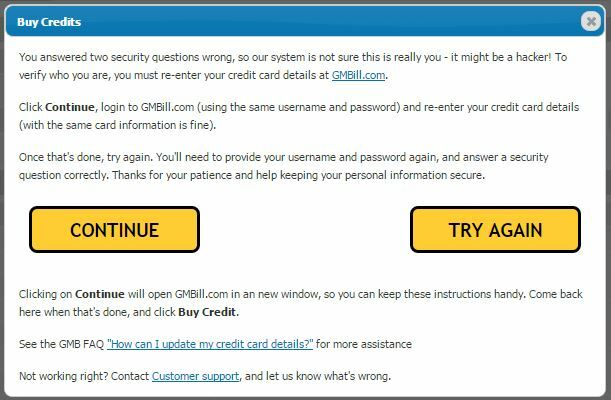 This FAQ answer shows how to re-enter your credit card info at GMBill.com, or you can just do it – it’s not hard (you’ll need your abbywinters.com username and password to log in at GMBill.com). You need to re-enter any details that show x’s (eg, Card number, CVV2, Expiry). You may choose to use a different credit card if you wish, but that’s not required. Once your credit card details have been re-entered, you can switch back to abbywinters.com, and try again to top up your PPS credit account. What if I keep getting the questions wrong? If you get the questions wrong, you’ll have to repeat the process again! You can always contact us with what you think the correct answers to the questions are – it’s possible there was a typo when you originally entered the data, and if you do not replicate that typo, you’ll not be able to prove you are you! We can help with that (but, we cannot just tell you what the data is – what if someone has access to your emails?). Let us know what you think the correct answers to the questions are. Real people. HQ Teelmanstraat 1-B, 1431GL, Aalsmeer, Netherlands. +31 6 1125 1302. contact@abbywinters.com. All material on abbywinters.com, including all layout and design elements, are copyright © 2000 onwards by abbywinters.com BV. Unauthorize distribution (Usenet, P2P, DVD, CD ROM, torrent, etc) and reproduction is strictly prohibited. This copyright will be enforced. So look out.